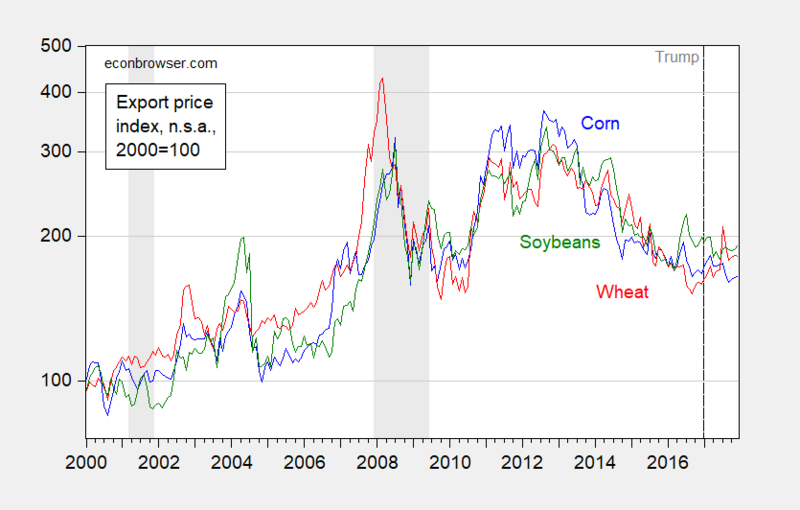 Figure 1: Export price of wheat (red), corn (blue), and soybeans (green). NBER recession dates shaded gray. Source: BLS via FRED, NBER, and author’s calculations. 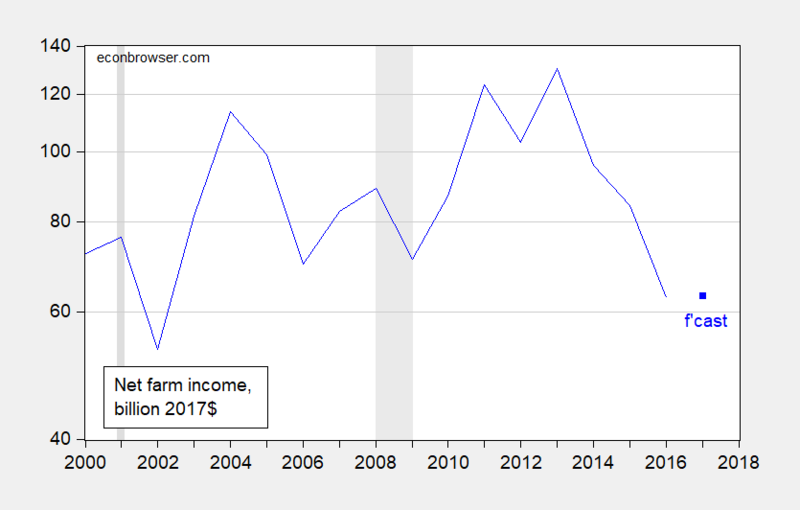 Figure 2: Net farm income, in billions of 2017$, deflated by CPI. 2017 estimate from USDA as of Nov. 29, 2017, deflated by CPI. NBER defined recession dates shaded gray. Source: USDA, NBER, and author’s calculations. If the Administration should go through with withdrawal from NAFTA, prices should decline further as Mexican and Canadian barriers against US agricultural exports rise. If China should retaliate against U.S. agricultural exports in response to recent (solar panels, washing machines) and incipient protectionist measures, then prices and quantities will be furthe pressured. This takes place in a context wherein, despite a weakening dollar, real exports of food, feed and beverages have decreased. Figure 3: Exports of food, feeds and beverages in bn. Ch.2009$ SAAR (blue, left scale), and log real value of US dollar against broad basket of currencies, 1973M03=0 (red, right scale). Gray shading denotes NBER defined recession dates. Orange shading denotes Trump administration. Source: BEA 2017Q4 advance release, December trade release, Federal Reserve via FRED, and author’s calculations. Food exports are down 3.1% year-on-year. Oh. And the President’s budget proposed reducing agricultural commodity subsidies by $28.8 billion (over ten years). This entry was posted on January 29, 2018 by Menzie Chinn. Maybe the Trump administration is correct to start to reduce agricultural subsidies by $28.8 B over 10 years. That is a start in the right direction. Subsidizing a popular lifestyle industry with significant environmental costs does seem to be rather inefficient and wasteful. Worse yet, the agricultural lobby manages to bend foreign policy to its purpose of exporting farm products. I sometimes wonder if the US agricultural sector causes more violence and wars abroad than any other US economic sector. Frankly, US agricultural exports should do well over the next few years. Global growth will continue to lift real incomes, meat consumption and demand for grain. Beating up the poor though is something Republicans and Libertarians completely agree on, so time cut SNAP for all those parasitic kids, cripples, and olds. This reminds me of the olden days of the Soil Bank. Seemed to make “bank” for some farmers. Sometime in the mid 60’s a young draftsman was working under my direction. He told me of his brother in law who was buying up some farmland. Seems he could put the land in the Soil Bank and get payments to cover his mortgage. My son need Home Bank so he can afford a house in the Bay Area. The bankers might be auctioning off the combines & tractors, but those rural Trump voters will always have their red MAGA hats. Is it time to queue the John Mellencamp song? I am so glad that after years of asking you, by me and others, to realize the importance of the agricultural sector in Kansas you now have found that agriculture is important and you are now an expert. The title of the post is “Farm Sector Prices and Income under Mr. Trump” and the first lines are “So far, so-so. Export prices trending sideways.” Kind of a negative statement. But no mention of the terrible drop in prices during the last years (since 2013 or so) of the previous administration. To the farm community, a period of sideways prices must be a relief and cause for hope. The same can be said and seen in the graph of income. And finally, what you see as a decrease in exports look every bit like the normal fluctuation seen throughout the graph, but not yet any trend. But then again, you are now the agriculture expert. Oh well, no harm done. How many voters read the newspaper in a “red state” anyway?? Republican Sam Brownback (the man responsible for cheerleading and enacting the “magical growth providing” tax cuts) was told (although Brownback has yet to fill his new job) he has a job with the VSG. He may have to change his name to Sam BrownNose. So, Ed Hanson, you ARE now an expert? But to be fair, my MC, a rice grower, has pocketed well over $5,000,000 in ag subsidies since 1995 . Not bad for a guy who was also pocketing about $95K/year as a state legislator and then $175K/year in the HR. Plus benefits. That’s all in addition to record rice prices and record exports in the first decade of this century. And, the government is now picking up the tab for most of his crop insurance!. You’ll be pleased to know he’s a self-styled “real deal conservative” who’s firmly opposed to low income people getting subsidies (SNAP) to buy his rice, for which he’s already been handsomely subsidized. No, I’m not an expert. Just an observer of overt hypocrisy. This is the message you get from that graph? What I see is volatility – not some Obama socialist nightmare for farmers. The export price index when Obama left office was twice what it was in 2000. I doubt general prices have doubled over the same 16 year period. The real message is we had a general commodity boom that was temporarily halted at the beginning of the Great Recession – then recovered for a while but is now unwinding. Now if you want to blame Obama for all of that – so hello to Sean Hannity for us. Ed Hanson: I didn’t mention Kansas in my post. But if you want to blame Kansas’s fortunes on agriculture — I think you want to be a bit circumspect. USDA ERS lists 2016 net value added in agriculture as $4.4 billion. Kansas GDP in 2016 (nominal) was $150.6 billion. Agriculture is then 2.9% of Kansas GDP, properly measured. One could add in machine hire/custom work, marketing/storage/transportation, and repair and maintenence, which yields another $1.1 billion. Then the value added of the agriculture-complex is 3.7%. So I don’t think Kansas’s fortunes under Brownback, including the recent recession in the state, is due to agriculture sector collapse. Those graphs above are Exhibit A on why I don’t think the VSG is going to enact his posturing on NAFTA. I don’t even think HE believes in taking down NAFTA. The only way the VSG takes a NAFTA-redue to Congress is as a very cynical move to have the idea voted on in Congress with assurances from McConnell and Paul Ryan that the bill will never pass, and just give the VSG a chance to grandstand for his illiterate base. And let’s say the VSG actually does believe taking down NAFTA is good policy, I think Gary “Kapo” Cohn will talk him away from the ledge, along with Fat Boy Sonny Perdue. OK but suppose Trump gets his way with fiscal stimulus Reagan style (tax cuts for the rich and a yuuuge defense department budget) and the FED ends up raising interest rates. 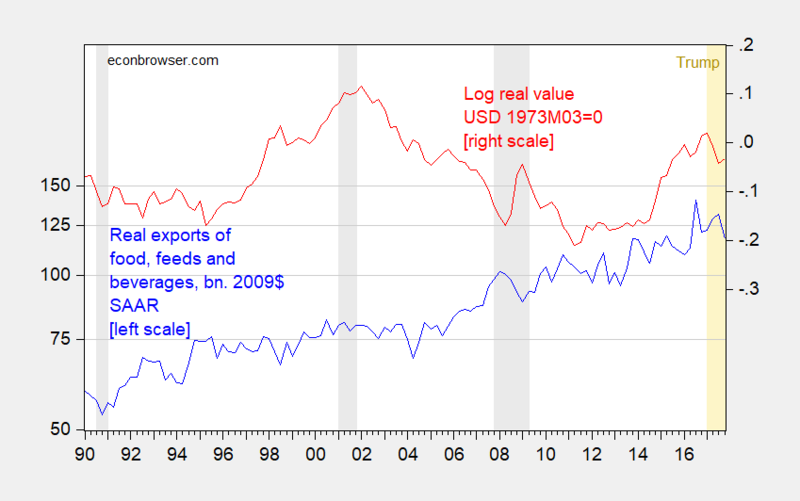 The dollar will appreciate which will really hurt farm exports as well as their relative prices. For an economics blog to overlook fundamentals is amazing. “The numbers are in from USDA, and 2017 saw a new record in average corn yield, with 176.6 bushels per acre. Betcha few will guess the fundamental to which I am referring. World supply is up which has lowered relative prices. OK! And of course old Ed decided this was all Obama’s fault! Congrats “CoRev”, you’ve proven what most people who read this blog, much less any idiot who purchases food at the grocery store, already knew. That ONE SINGLE factor alone, the yearly supply, does not dictate the variations (or long term trends) in the price of commodities. It’s really cool you know how to use Bing though. Steve Ballmer thinks Bing is super trendy, or as Ballmer likes to say—“groovy”, which is why he slobbers on himself watching LA Clippers games now. Bill Gates and Steve Ballmer also would like to know how many “blue screens of death” you average per day on your Microsoft system?? is it over or under 50 times?? Moses, I see I hit the mark again. Of course as Menzie has documented, farm income is a small fraction of Kansas’s overall value-added. But nice try! Corn yields in the US were up in 2017; however, total US corn production was down 4 percent. That was largely due to 5% fewer acres being harvested. That does not mean farmers planted 5% fewer acres, it means they harvested 5% fewer acres. Part of that is because marginal land took a hit, which tends to raise average yields. But the big story is (and has been for the last few years) that farmers have moved away from “low till” and “no till” farming and back to deep plowing, largely because of “super weeds” that are more resistant to herbicides. Deep plowing increases yields over the short run, but soil erosion (which had been stabilized through the 90s and 00s) has resumed at an alarming rate. And globally farmers are using fertilizers at growing (and in the case of Chinese farmers an exponential) rate. Check out the World Bank data on fertilizer consumption. CoRev I don’t know where you got your wheat data, but it’s wrong. According to the Nov 2017 USDA report global wheat production is actually down slightly (1.9M tons). In fact, weak US wheat production is to blame (down 15.5M tons). As to global wheat production, yields were up slightly (around 1.5 percent), but that’s partly due to the fact that quite a bit of marginal land was taken out of production. Remember, that raises the average yield. Total hectares harvested was the smallest since 2013. As to corn and temperatures, corn responds favorably to rising temperatures up to 89.6 degrees F. After that growth slows down and essentially stops after temps get to above 95 degrees. BTW, in the US sorghum production was down 24 percent and rice production was down 20 percent. Soybean production was up slightly (2 percent), but that’s only because harvested acres were up 8 percent. Average soybean yields fell. The one bright spot was cotton production, which was up 24 percent with harvested acres up 19 percent, so a slight rise in yields. So CoRev shows us that world production is up but properly measured US production is down. Which explains why world prices are down and at the same time highlights Menzie’s suggestion that Trumpism has not exactly Made American Farming Great Again. 2slugs, your data may be later than my chart. Dunno & don’t care. AFAIR last Spring’s weather was very poor, especially for wheat. Since Spring USDA predicted our wheat production would be down. I appreciate the responses, except I did not write about either farm subsidies nor Kansas government. But I will about susidies. Non – do you care about all subsidies or just agricultural subsidies? Is it just crop subsidies or do you care about conservation subsidies? Did you hate the subsidies that made Tesla a company with a greater worth than GM? How far are you willing to go against subsidies? Is it the idea of subsidy or just the practice of giving other peoples money. But I would also ask you to respond to what I originally observed. The graphs show sideways is better than the last few years. You do not have to be an expert to read a a graph. Perhaps Menzie has addition information that show a negative trend in the future but the graphs are not it. I thought you referenced something about “Kansas” and “experts”. My bad. You are very “deep” in your observation of graphs though….. Ed. At the risk of repeating myself, agricultural prices were not exactly low during any of these years. More importantly to suggest any modest and temporary drop in prices was Obama’s fault and not the result of world market forces (see CoRev’s graph) is just stupid. Pgl, why are you defending Obama, when he wasn’t even mentioned except by you and Sherparick? A little too sensitive, me thinks. Living in the big city, you may not fully understand what factors actually effects annual production and prices. Whoa – I am not an Obama cheerleader so I consider your latest to be a bit of trolling. My point was simple – the market drives a lot of this. Now if Obama was some communist planner, I can see criticizing him for bad planning but I would hope you would agree with me that it is good that he has let the market do its thing. Or are you advocating we do this Soviet style? I’m not advocating anything, just pointing out your sensitivity: ” More importantly to suggest any modest and temporary drop in prices was Obama’s fault…” Your defense of Obama belies your claim: ” I am not an Obama cheerleader …”. Your may be not a cheerleader, but are a defender. Subsidies, Ed, have laid to rest the idea of getting government off the backs of American citizens. Their widespread use indicates government is neither the problem nor the solution but a partner in both expanding private and public life. The American South and Southwest have grown with the use of government incentives/subsidies to aid private and public development. Texas, for example, has grown dramatically by liberally siubsidizing—with taxpayer funds— industrial and business growth. My main problems with subsidies normally reside with the subsidized. If you don’t need $5.294 Millions— the amount paid by the government to my MC—why accept it, especially if you’re the real deal up by the bootstraps conservative you say you are? And if you’re a state that spends millions to entice private development, don’t pretend government has no role in improving the lives of citizens. Erik, if you trace subsidy payments to California farmers/growers since 1995, you land in the middle of Trump country/counties almost exclusively. $12 Billion ain’t chump change. That includes large swaths of both the Sacramento and San Joaquin Valleys where Trump garnered significant votes. Most interesting, you see in dairy subsidies how/where Nunes and McCarthy constituents have directly benefitted. The same Nunes and McCarthy who demand less government/government spending, especially spending on uneccessary stuff like education and medical care. Is it Brownback’s fault Kansas produced too much grain contributing to a global grain glut? Kansas led to a global glut all by itself? Try providing some real world data for a change – like CoRev did above. Pgl, try to learn the concept of supply & demand. There you go again. Lecturing us to learn basic economics. Alas you never did. Now – check your Amazon account as I sent you those copies of Mankiw’s books since you are too poor to afford them. Menzie just documented that this proportion is well less than 4%. Large??? Bottom Feeder flunks again! If the Obama administration is criticized for allowing this to happen, the criticism should be from the left since the policy was one of “laissez-faire” and neo-liberal orthodoxy, something I would think libertarians would find encouraging in a Democrat. Politically, it was stupid, as so many neoliberal policies are since it tipped Iowa to Republicans in 2014 and 2016. We need to spend more money on the truly needy, not waste tremendous amounts of money keeping people poor – incentives matter. People need to contribute their fair share – producing goods & services, paying taxes, giving to church or charities, etc. – to help those unable to work and temporarily out of work. Lamenting farm exports is likely to prove a weak hand. 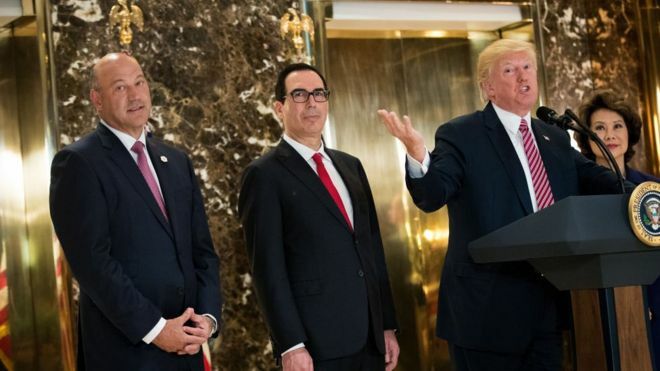 First, the dollar is weak, and has weakened with increasing oil prices, just as it strengthened with weakening oil prices, with the trade deficit held constant throughout. I think we’ll see some oil price weakness, but it is likely to be transient. Thus, in dollar terms, even at constant volumes, US ag exports should do well in 2018. Further, we are seeing synchronized global growth, and that usually mean increased commodity prices and demand for US ag exports. This again should lift farm income into 2018. I think the key metric to watch here is the change in Caterpillar sales. These are growing quite smartly, and as long as they do, I would expect to see strength in the commodity sector. First, despite the 2.0 percent increase in nominal average state land values, the inflation-adjusted Iowa farmland value on average actually saw a 0.2 percent decline. In other words, the growth in general inflation in the U.S. economy actually outpaced the seeming gain in the farmland market. Second, the recent increase is largely influenced by very limited farmland supply, so if more farmers are forced to liquidate a portion of their assets due to heightening farm financial stress, there will be more land parcels available on the market, potentially allowing the land market to go down in the future. An analysis by Dr. Alejandro Plastina using farm data from the Iowa Farm Business Association shows that the share of financially stressed farms (vulnerable liquidity or solvency ratings) increased from 38 percent in December 2014 to 47 percent in December 2016. The Federal Reserve Banks in Chicago and Kansas City also reported continued deterioration in agricultural credit conditions, as a result, the downward pressures on the farmland market are still present. Finally, many neighboring states, from Kansas and Nebraska to Illinois and Indiana, all saw a modest decline in their land market compared to a year ago, according the surveys conducted by the Federal Reserve Banks of Chicago and Kansas City. There is no explicit reason to believe that Iowa’s land market has a fundamentally different dynamic than those of neighboring states, especially Illinois and Indiana. Actually, the Ag Economy Barometer, a nationwide producer survey conducted by Purdue University, reported that more producers expected to see a lower land value in their area as opposed to a higher land value. Note the comment about the sharp increase in financially distressed farms. 2slugs, did you have a point in your review of the Iowa farm land price comparison? With this comment it’s not clear you understand what drives land and crop prices: “What we see is a steep drop in farmland values during the “booming” Reagan years (high interest rates and a strong dollar), which was a result of the farm foreclosure crisis.” I hope you understand these impacts on farmers. High interest rates do lower the values of property for a given cash flow. And the dollar appreciation lowered relative farm prices which would negatively impact cash flows. I see Bottom Trader does not understand freshman finance! Sorry – CoRev was the one who flunked basic finance. I guess I get these two confused. CoRev I think pgl said it pretty well, but I’ll just add that one of my (I thought not-so-hidden points) was that what we’re seeing now is a bubble economy in farmland prices with a lot of the farmland highly leveraged and under stress. High interest rates and likely future dollar appreciation will hurt farm cash flows, and that could start an avalanche of distressed farm sales not unlike what we saw in the mid-2000s when the housing market collapsed. Farm foreclosures lower property values as farms get dumped on the market, which puts further downward pressure on farm values, which puts even more highly leveraged farms under financial water, etc. The sad irony is that Trump’s policies are likely to hurt the very folks that were his strongest supporters in the same way that Reagan’s deficits, high interest rates and dollar appreciation hurt farmers in the 1980s. Let’s take this to the next step. After these small farmers lose the family farm, it will be big agribusiness that ends up buying these properties at bargain prices. Of course Mitch McConnell and Paul Ryan will be elated as this means more fat campaign contributions for the GOP. McConnell reminds me of Lord Palpatine every time he smirks that evil grin of his. And the Emperor is Star Wars is fond of saying – “Just as I Foresaw It”! 2slugs, you purely speculating on what might happen to farm land prices. This article was targeted on Grain prices. That’s why I asked for your point relative farm (output) prices. I used output to be more inclusive than just grain. Pgl, why all the snark? You said: “High interest rates do lower the values of property for a given cash flow. And the dollar appreciation lowered relative farm prices which would negatively impact cash flows.”, but actually meant:” High interest rates may lower the values of property for a given cash flow. And the dollar appreciation can lower relative farm (output) prices which would negatively impact cash flows.” There fixed it for you. Weather is the primary mover of farm output prices. Weather directly effects yield, note 2slugs reference to 15.5M tons wheat harvest drop in the US, while later crops, particularly corn had record yields.